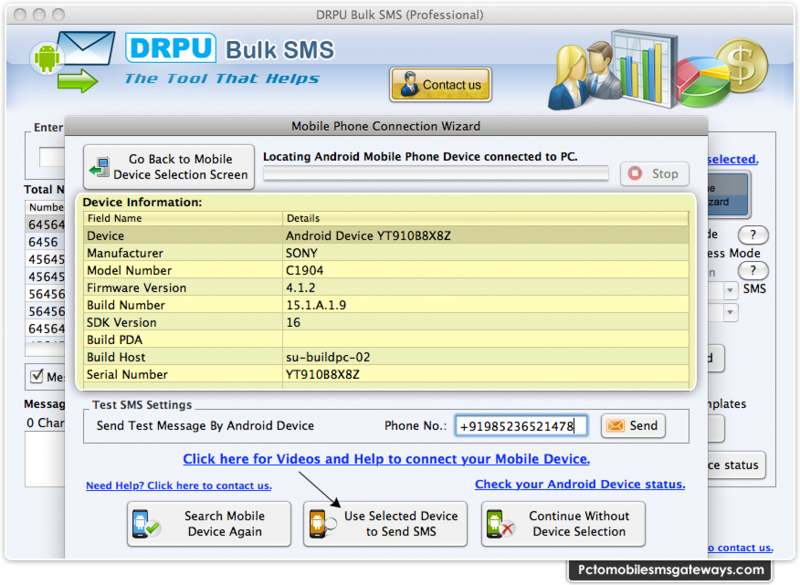 PC to Mobile Mac Bulk SMS Software – Professional empowers you to send thousands of text messages including job alerts, business reports, market news, product promotional SMS, invitations etc from Mac machine to user’s mobile phone using GSM or Android technology based handset. Mac bulk SMS software – Professional is designed to send mass messages and notification to group of people instantly without use of internet connection. With our Mac bulk SMS Software – Professional, you can connect with national and international user to convey mass messages. Software provides facility to send unlimited alert messages simultaneously. Provide facility to broadcast bulk messages contain Unicode (Non - English) character. Supports multiple GSM technology based mobile phones. Has ability to skip duplicate number entries. Provide facility to load contact from file. Software provides option to save sent messages in .txt and .html file format for future usage.